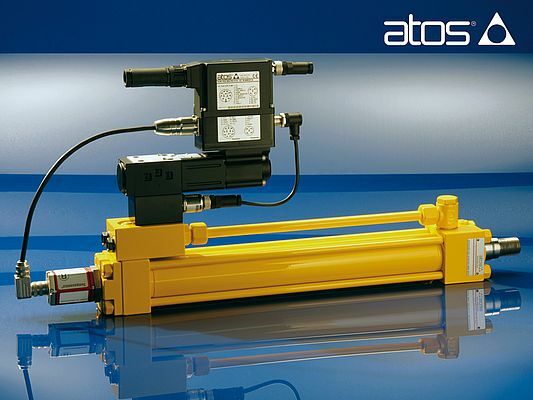 Representing an electro-hydraulics solution to the imperative demand for easier subsystems configuration, Atos smart digital servo-actuators integrate many functions in a single, compact and programmable motion unit. A low friction servo-cylinder with integral position and force transducers allows accurate movements with no stick-slip phenomena coupled with high translation speeds. A high performance servo-proportional valve that is equipped with on-board electronics ensures the nest hydraulic regulation and fail safe features. An integral digital driver and axis controller, designed for electro-hydraulics motion control, improves performances thanks to new specifically developed algorithms. Fieldbus interfaces include CANopen and PROFIBUS-DP. Two independent units offer slave and cycle controls as basic operational modes. The slave control mode precisely performs the motion closed-loop control in real-time based on external analog or fieldbus position reference signals. The motion cycle control mode carries out a pre-programmed position/time motion cycle with closed loop control. The machine’s electronics just needs to provide digital commands to synchronize the servo-actuator to the overall machine working cycle. An innovative position/force function allows a single device to manage both the dynamic motion and the force control phases of any electro-hydraulic axis. The axis controller automatically defines which control is active, at any time, according to the position, pressure or cell transducers’ feedback. The company’s intuitive software with a powerful graphics interface allows easy setting and programming of the servo-actuator for the best performances, diagnostics and customized motion profiles pertaining to specific application requirements.